How Far is Concrete Destina? Welcome to an abode of magnificent apartments for sale in the heart of Serilingampally, Hyderabad. A meticulous project by the top real estate group in the country, Concrete Constructions. 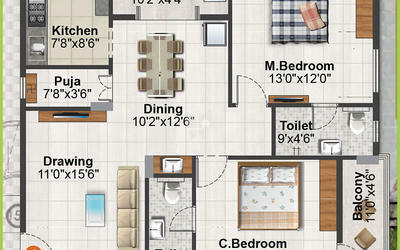 This project is located in a prime location and it serves you ready to occupy apartments for sale in Hyderabad. 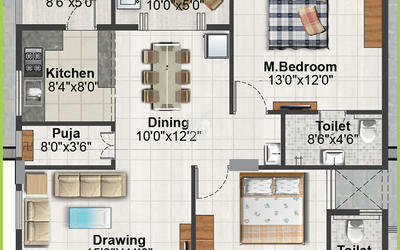 Concrete Destina offers you thoughtfully crafted 2BHK apartments with a dimension of 1235 - 1250 sq. ft. as well as 3BHK apartments for sale in Hyderabad with modern day amenities and features that are essential for daily needs. 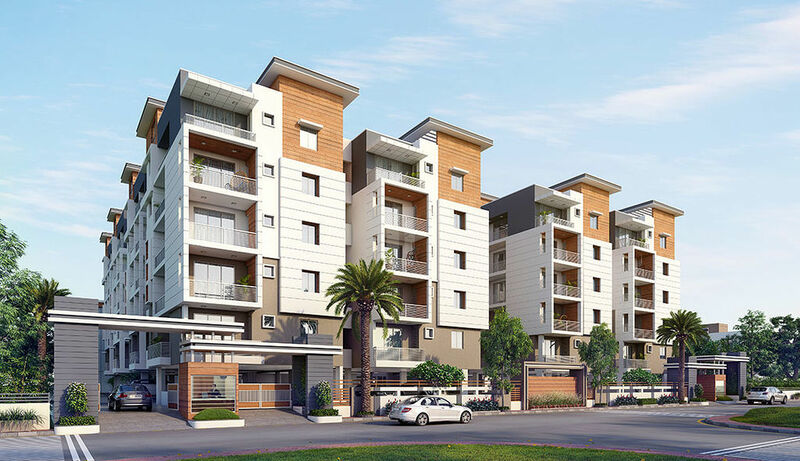 It is perfect for contemporary lifestyle, it elevates your standard of living and allows you to live in a residential space which is surrounded by the serene environment. This project is built with superior engineering, attention to detail, to provide you a perfect housing solution. These homes are ideal for people who seek property in Hyderabad, it ensures your convenience and hassle-free lifestyle, you will be close to your work and would also live in a residential space that makes you forget rest of the world. RCC framed structure. Red Bricks 9” for exterior walls and 4” for internal walls. Internal and External Double coat cement plastering. Main Door: Teak frame with designer Teak veneer shutter with melamine polish with Brass / S.S. fittings. Internal Doors: Teak frame with designer Teak veneer shutter with melamine polish with Brass / S.S. fittings. Windows: UPVC sliding shutters with mosquito mesh track provision and designed M.S. painted grills. Somany or equivalent 2’x2’ vitrified tiles flooring for hall, bedrooms, dining, kitchen & balcony. Anti-skid tiles in toilets. Granite flooring for staircase and corridor, S.S. Railing for staircase. Toilets: Somany or equivalent designer Matt ceramic tile dado up to 7’-0”. Kitchen: Glazed ceramic tile dado up to 2’-0” height above kitchen platform. Utility / Wash: Glazed ceramic tiles dado up to 3’-0” height. Internal: Two coats wallcare putty and two coats of Asian tractor emulsion paint over a base coat of primer in all rooms. External: Asian Apex painting with wall care putty and texture. Common area: Asian tractor emulsion. Black granite platform with stainless steel sink. 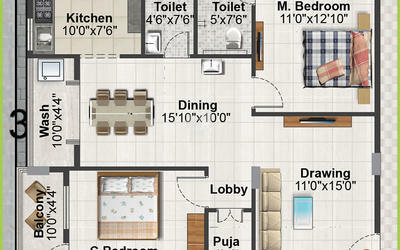 Provision for chimney, water purifier, microwave oven and washing machine in utility area.